Room for everyone! 4 bedrooms, 3 bath, Lower Level has a second kitchen and living area. Walk out to lake side, large deck with view of the lake. Hickory cabinets, main level laundry, central air, breakfast bar, wood fireplace on main level and free standing wood stove in lower level. Long Lake has great fishing including Walleye, Large mouth Bass, Pan fish, Northern, Perch and Crappie. 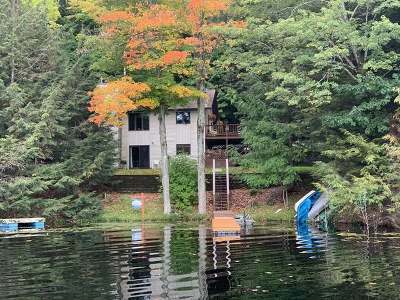 This Clear deep lake has it all with depths of over 70 feet in front of the home. Enjoy the peace and quiet of this bay and go out into the larger area to do the water sports. Have a full rec lake without the boat traffic! Home built in 2000.